Time to check out a company that is new to the blog but maybe not new to you. It's Gelato Petrini, based in Florida. If you don't know who they are, the container says "a family tradition since 1957" though their history page says the company came about when the Cohen family teamed up with Chef Petrini in 2011, so I'm guessing this is an old family recipe. Now this brand just popped up at Roche Bros a few weeks ago at $5.99, but when I went back again this week, it was just $3.99 on sale, and who am I to skip a chance to try some all natural gelato for four bucks? Lid removed on the semi-clear gelato container. A take a few bites and it's got a nice soft texture, though a little bit gummy in a way that reminds me of frozen custard. The flavor is reminscent of a custard too as there are eggs in here and you can definitely taste them. The cookies bit aren't nearly uniform enough for my liking. 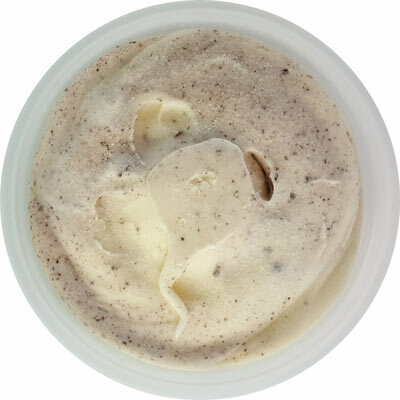 Much of the gelato is devoid of any cookie bits, and the part that does have them, well, it doesn't have enough. Their flavor just isn't coming across strong enough and for the record, I examined several pints in the hopes of picking the one with the most cookie bits. The cheesecake flavor is very weak. There is some sweetness and familiarity here, but if I didn't see the label then I would think this is a sweet cream flavor more than a cream cheese flavor. Am I splitting hairs? maybe, but it needs to be said. On the rogue occasion that you get a decent sized bit of cookie wafer, then you do get a nice overall flavor, but I was promised this in every bite. Well, maybe not every bite, but it's what I expect when you call something cookies & cream. First scoop is done and the moral is that I'm calling in to question (cookie) quantity more than quality. Overall quality seems fine here, though this being my first egg infused gelato does have me a bit of a loss as I have nothing to compare it to really. On Second Scoop: Pretty sure I liked it more on the second scoop as evident by the fact that the second half of the pint is almost gone (and will be finished in a few more bites). 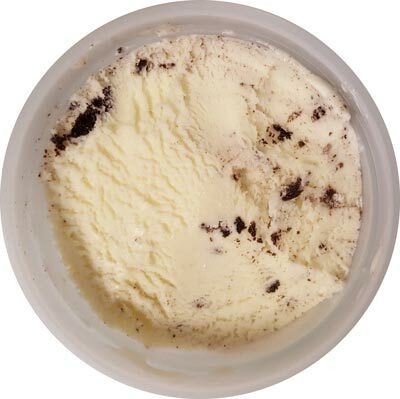 While it's not at cheezy as expected, it does have an air of cookies & cream cheesecake to it. It's like an aftertaste of the crust or something. Ok, that probably sounds odd, but what I'm saying is that they have similar aftertastes. There does seem to be a bit more cookies in the second half, though I would still like to see more overall. It still seems like it's half C&C gelato and half cheesecake gelato or something. Even without tempering, it's still a pretty soft texture, but more eggy (custard-y) than the Talenti pints that many of you are familiar with.Overall it's definitely got me curious enough to try another flavor or two, and I need to verify that all the flavors have egg and not just this one. 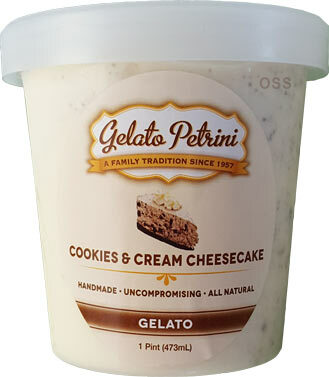 Note: if you have Gelato Petrini in your area, note that their most recent new retail flavors are vanilla bean, caramel macchiato, and gianduia aka chocolate hazelnut. I think I may have seen this one but I didn't know what it was. If you've had them before, let us know in the comments! Im in South Florida and this brand is carried by all the Fresh Market locations and some specialty store. They also have a storefront scoop shop near me. I've never had the flavor you sampled. The 3 flavors I have had I really liked. They are: Espresso Chip, which has cinnamon in it and tastes much better than it sounds, its really unique and delicious; the Key Lime Pie which has graham crackers in it and is appropriately tart; and the Chocolate Raspberry, and I happen to love that combo in pretty much any form. I like the texture of this brand, really rich and creamy. Can't say if they all have eggs or not but maybe thats why I like the texture so much. Please try another flavor! I live in Boca Raton and also see it in Fresh Market and used to frequent their gelato parlour in town before it suddenly closed a few years ago. The parlour was always filled with people lined up to get their gelato and drew rave reviews. I'm a vanilla girl and loved their version, while family and friends raved about their Espresso Chip gelato and flavorful sorbets. I also hope you'll try some other flavors and discover how wonderful they are! Thanks for reviewing newer options along with the more widely-distributed brands! thank you both for the comments, I will definitely try them again as the summer goes on.